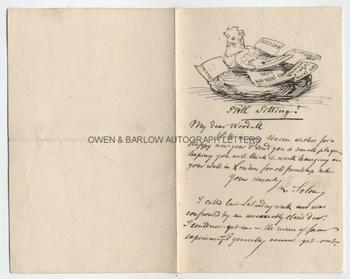 MARC-LOUIS SOLON autograph letter Signed with drawing. French artist specialising in ceramic design. ALS. 1p plus integral blank leaf. No place, no date. To [William] Woodall. "With many sincere wishes for a happy new year I send you a small plaque hoping you will think it worth hanging on your wall in London for old friendship sake. I called last Saturday week and was confronted by an unreasonably closed door. I could not get in - the reverse of former experiences - I generally cannot get out." 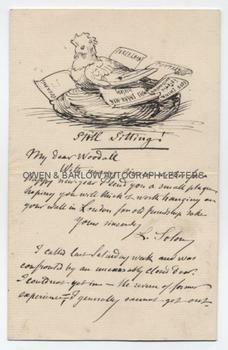 The letter illustrated at the head by a pen and ink drawing of a broody hen sitting on a nest, surrounded by pieces of paper bearing various captions, "Porcelain", "pottery", "ceramics", "soft china and idiotic earthenware", and "Miss Sarah Mik History". The last probably being a humorous reference to his 1883 book 'The Art of the English Potter'. The whole drawing captioned "Still Sitting!! Marc-Louis Solon (known to his English friends simply as Louis Solon) worked, initially, for the Sevres porcelain factory in France before moving to England in 1870. He worked for Minton and spent the remainder of his life in Stoke-on-Trent, specialising in pate-sur-pate ceramic decoration. He became, arguably, the most fashionable porcelain designer in Britain and established a Royal patronage. Solon's pieces were in huge demand and items, such as his ceramic wall plaques, were much prized. He had a close friendship with William Woodall, who was M.P. for Hanley and Stoke on Trent and was also a trustee of the Wedgewood Institute. Marc-Louis Solon was unable to keep pace with demand for his work and eventually became obliged to train a number of assistants in his technique, amongst them Frederick Rhead. 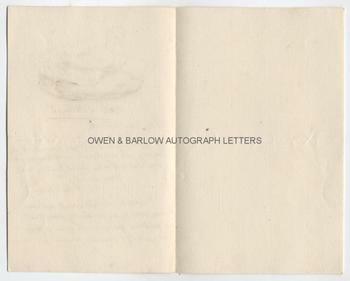 This letter clearly dates from this period of great activity and the date of his working on the monumental history 'The English Potter'. Letters and drawings of Marc-Louis Solon are rare.